It takes a lot of work to get people to a blog or to a website. You need to use keywords and give the process some time, too. However, you can eventually get your client traffic at his site by simply being consistent. In other words, plan to post to the blog three to five times per week (at least). Be sure to have your keyword strategy worked out with a focus on both local and long tail keywords. Once you do this, people will start coming to your website. The last thing you want to do is not to convert each one of them to a potential customer or strong lead. However, one statistic that most business owners do not know, and one that can really change the scope of any business — is the fact that it can take several visits to the same website before a customer will buy or contact the company for more information. How do you manage this? One way of doing so is to use an email list, and sequenced marketing. An email list is simply a collection of information you gather from those who visit the website so that you can email them again at some point in the future. In this chapter, we will break down what an email list is, how to create one and tips for using it. Most companies I work with (95%) do not create a smart email marketing program. It’s a common trend. Where do you start building consumer email lists? An email list is a collection of names and email addresses (sometimes more information) from those who visit your website. This is not a shady business practice. Rather, you will be asking those who visit your website to provide this information to you on their own. They will give you the information, in other words. You’ll give them something they need in exchange. No spam or selling email accounts. Most email lists are managed through an automatic system (aweber, constantcontact, icontact to start). Depending on the type of website design and the hosting your client purchases, auto responder or email list marketing software may already be available to the client. If not, you can find a variety of free or low cost services available on the web. The software should collect data from the site when a visitor enters they information – automatically. The system should allow you to create emails that will be sent to those who sign up at the website to get this information. The system should give you tools to use to create effective emails and newsletters to send out to your sign ups. The reason for using an email list like this is quite simple: it is the best way to get people back to the website who have left it. Imagine this: a person gets to your website and likes what they see. They are not ready to make a decision on a purchase or to contact the company. However, they are willing to receive emails from you. You set up an automatic system that will send emails to those who have signed up on a regular basis, pulling them back to the site time and time again. This is an easy and highly effective way of using your traffic wisely. It is something that every Internet marketer needs to use. However, the process is in fact fairly simple to manage. While having the software set up is the first step in creating an effective email list, there are a few more steps to setting this type of system up. Give something away for free to those that sign up. For example, you might be able to offer a discount coupon or a free shipping charge offer for those that sign up for the email list. If you have some great tips, share those – and don’t hold back. Extend the free-line, as the saying goes. Once you have done this, people will begin to sign up. Use your blog post to encourage this to happen, too. At the end of the blog post, offer a sentence or two about the benefits of signing up. For example, “Those who have signed up for our email list will be receiving a list of our new products this week or access to our upcoming webinar.” However, ensure all information is accurate. Now that you have the list set up, it is time to use it. This is part of the small business’s marketing method so it is something that you will need to use. However, you can outsource the creation of text to other people if you feel the need to do so. You should remain in charge of what type of content is presented into an email list. There are two main options that you should have the system designed for. You want the readers to receive welcoming emails and regular emails that are ongoing, but not too frequent (until you have created a relationship). These may simply provide readers with information that they need, or are looking for. These are sent out in a specific order and timeline based on when the customer signs up. You do want to include timely emails that may provide information about sales, discounts, new product lists, cool products, free services, etc. These should occur whenever this information becomes available. You can add more information via an e-course, for example. The emails do not have to be extensively graphic or massive details to have a good effect on the reader. However, their job is to get the customer to accomplish a task. That task may be to get them something that will help them, bring them back to the website to get service or to contact the company directly for more information or service. Work this slowly – today’s web surfers are savvy, and don’t like to be pitched. Every business is different of course. Amazon will have a different impact than an unknown company, just starting out. It is critical that the emails encourage the reader to take some type of action. Most people will not sit and read an email without going to a website anyway. Ensure that the proper HTML is used so that the customer’s name is listed at the top of the email. This is polite and offers an appropriate greeting. Test this also. 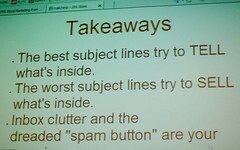 The content of the email should not just be a gimmick to get the reader back to the website. It should provide quality content, since this is what will drive your relationship building – and eventually more sales. Customers want to know they are dealing with an authority, and that you are trusted. Do give them a reason to react. It may be a sale or it may be a special offer, and the goal is to get the customer to react to the email. When used properly, email marketing and marketing sequencing can be highly effective. It is a logical piece of the Internet marketing strategy. Dear friend – why are you not doing this?